I originally picked up this fun, amusing story as a birthday present for my ten-year-old niece, but I made the mistake of reading the first pages when it was delivered and had to go out to buy my own copy so I could finish the story. It has made great reading for the grandkids when they come for a visit. Gertie Grimthorpe comes from a long line of witches, but unfortunately she’s never really fit in the witch community. She doesn’t look like all the other witches, and all the characteristics the community associates with them, hooked noses, pointed chin, and not such pleasant personalities. Gertie is beautiful and a genuinely nice person. But Gertie wants to fit in, even hoping she’ll soon grow her first wart. Her mother decides she might get things moving along if she sends her daughter to a school for witches, hoping she’ll at least learn how to concoct a simple spell without having it backfire. 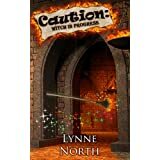 Lynne North did a great job, the story fun, this quirky cast of characters easy to picture as we follow Gertie in her quest to become a ‘real’ witch. Several places had me laughing out loud. For any of those with tweens, you can’t go wrong with this one, and even for those who are a little older (or a lot, like me), and still embrace the child that lives inside you, I guarantee a fun journey. Posted by Denna Holm on January 9, 2014 in Archives and tagged children fantasy, fantasy, five star review, quirky fun, witch.